We've all had a go at placekicking, haven't we? Maybe not in a match situation, but at very least up the park of a weekend morning? First you have a quick scout around to make sure no one is watching, then you place the tee in a position that's not directly in front yet not too far off it either, then you perch the ball you got for €4.99 in Dealz on top of it. Next you go into your ‘routine’. Well, it's probably not yours rather a version of one from a pro, because once you place the ball you start to realise that although you checked nobody was watching, that could easily have changed by now so not only do you have to go through with this no matter what, you should probably look like you know what you're doing. So finally after throwing some grass in the air (learning nothing in the process as you forget to make note of which way it blows) you take a few steps back, draw breath, and run up to give it a hack. On some occasions, you make a balls of it and it skids along the ground towards the try line. Other times, you get it up in the air but it goes nowhere near the posts. And once or twice, it actually does sail majestically over the bar though naturally those times absolutely no one is watching, not even those who came to the park with you. Now - imagine taking a place kick from a more difficult position, in front of over 50k people, and not only does the match have season-defining implications, so does this particular kick. NOW - imagine doing all of the above with searing pain going through your kicking leg. Actually, imagine making the decision to kick at all knowing you've had that pain for several minutes. I have tried imagining all of that. I can't. Especially the decision bít. I thought Ross Byrne had taken leave of his senses. Of course I knew he could normally make it from that position, even though he had already missed a couple on the day; it was all about the way he had been hobbling for a few minutes prior to that moment. 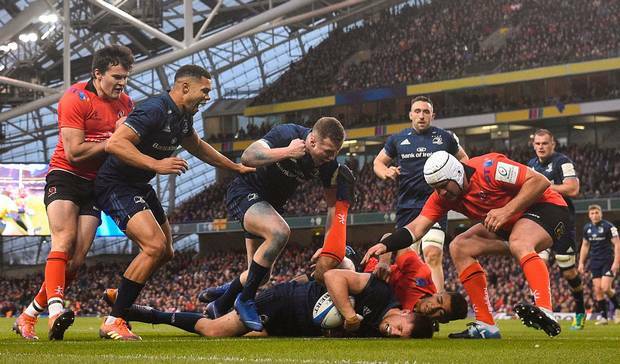 Clearly there was an element of ‘shot to nothing’ about it; even if he missed, Leinster would probably end up with possession from a 22 drop out. But still the kick to the corner putting the onus on the forwards looked like the only choice. Yet he nailed it, literally playing through the pain and reaping the rewards. All the headlines seem to be about an error that happened earlier in the half, but while of course we can't ignore it, Ross Byrne's late three pointer was actually the pivotal moment of an awesome 80 minutes. I just did a quick Google of the phrase ‘cup rugby’ to see if anyone had ever taken the time to scribble down a proper definition for it. I couldn't find one right away, but in case nobody has, there is no longer any need. Just say ‘watch all 80 minutes of Leinster v Ulster on March 30, 2019’ and leave it at that. Even the build up was ideal. With fully fit squads Leinster were always clear favourites but once you start taking players like Johnny Sexton and Robbie Henshaw out of the equation, it started to even things out, and if the perceived underdogs could lay down an early marker, it would turn the tables even more. Cue Iain Henderson clattering Sean O’Brien after 26 seconds. Then Rory Best forcing a turnover less than a minute later. Exactly the kind of leadership Ulster needed at exactly the right moments. For me, what defines ‘cup rugby’ the most is not playing perfectly, rather reacting the right way when things go wrong, whether it's by you or against you. Ulster had their first attacking lineout just outside the Leinster 22 with 5 minutes gone. Rory Best got a bit of stick during the Six Nations for a few darts that went astray so he would not have been pleased when this set piece was spoiled by the Leinster pack. But did that mean he gave up and felt sorry for himself? Absolutely not. Instead he set about making Leinster's exit as difficult as possible, and when Garry Ringrose thought he had shimmied his way into a position to clear, it was the Ulster and Ireland captain who got himself in the way of the kick, and the charge down got every ounce of the luck it deserved when it fell kindly over the line for Kieran Treadwell to give the visitors the best possible start. With the conversion from John Cooney, all of a sudden it was 7-0. How would Leinster respond? Well, this time we were the ones who made the mistake, so it was our turn to find a way back. From this kickoff we did to Jacob Stockdale something very close to what Wales did in Cardiff a few weeks before; letting him catch the restart before bundling him into touch. Once we secured our own lineout, we were finally able to put together a series of phases and show what we could do. And what very impressive phases they were, 25 in all to be precise. Nothing too flashy, just lots of carries, lots of decoy runners, lots of accurate clearing out, until Ross Byrne spots a gap and takes it over the line to finally get the home crowd into the match, although he did go on to push the conversion wide. 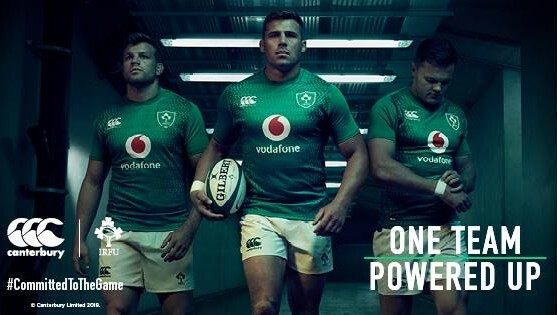 Then after just 14 minutes, we had the first of the day's significant leg injuries when Rory Best was forced to leave the action early and from the look of his face it appeared even his World Cup chances could be in jeopardy. It goes without saying that all involved in Irish Rugby wish him a speedy return. So after the frenetic start, the match needed to fall into something of a pattern, and not surprisingly given we were talking about two Irish teams, high kicking was to be the tactic of choice for both teams. This gave rise to an interesting recurring duel between Adam Byrne and Jacob Stockdale. Both have clearly put a lot of time and effort into this area, and both have become so good that oftentimes they'd both catch the ball at exactly the same time. And it's not like the kicking wasn't warranted either - once the two sets of defences were able to settle after the early tries, they were very difficult to break down. One of the features of Ulster's famous win at Thomond Park in 2012 was that they made about 180 tackles altogether, yet last Saturday, they registered over 220, with four players hitting 20 or more, including Rob Herring who came on for Best. All of this cancelling each other out meant that the teams traded penalties up to the halftime whistle, sending the visitors into the break with their two point lead. It left the match really well poised, and made the first score of the second half a potential match-winner, so it as all about how the respective coaching staffs proceeded to make some changes to get beyond the tackling lines. The second serious leg injury on the day hit Leinster when Rory O’Loughlin, who had been doing very well in the Henshaw role, had to withdraw at halftime with a dead leg. Losing a centre early was one of my biggest concerns going into the match, so there was a lot of responsibility on Noel Reid's shoulders when he took to the field. Overall I think he did very well, in fact everyone who played centre on the day did overall. I say ‘overall’ because right at the start of the second half, Garry Ringrose nearly had a Groundhog Day moment when he tried to clear the restart only for it to be blocked by Herring - thankfullyfor Leinster fans, this time the block took the ball all the way over the end line. With that scary moment over, we began to see what the two teams had changed, and both seemed to have the same idea, namely putting extra numbers into the wider channels. Now I could be totally wrong here but I think all those who are highlighting what happened next as a ‘mistake’ are being extremely unfair to Dave Kearney. In fact, I think Dave had an amazing afternoon overall with little or no credit, but let's focus on this incident. Stockdale's mistake, apparently, was that he didn't use both hands to put the ball down in the corner. But when Kearney gets to him, he actually manages to make not one, but two grabs at the Ulster winger's right arm, and what's more just by being there it meant Stockdale had to hurry a bit to get the ball down. All I'm saying is that if Ulster are to get credit for forcing the Leinster mistakes which led to many of their points, then perhaps so should Kearney in this case. So with the TMO telling referee Romain Poite it was a knockon and Leinster winning a penalty at the ensuing scrum, the chance was gone and the all-important first score of the half was still up for grabs, With us having possession around halfway now, we got a look at what Messrs Cullen, Lancaster and Contepomi had in store for the Ulster D.
It seems we went for a similar yet possibly more subtle tweak, namely putting Sean Cronin's barrelling runs into the widest channel, and it didn't take long to show some progress. Eventually it seemed to be Ulster's attempts to be mindful of his presence out there that allowed man-of-the-match Jack Conan to make the line break that led to Adam Byrne's try. That's not to take anything away from Conan, of course. Not only did the break still have to be made, but he also had to gt the ball to his winger and while he made it look easy it was anything but. And in the midst of all of this he even had time to attend to some wardrobe issues as his shorts had been pulled down! So when Ross Byrne added the extras it meant Leinster were now up by 5 which had to be tough for the Ulstermen given they had done so well up to that point. Well many teams would have thrown in the towel in that situation against the reigning champions but not this lot. Not long after the Leinster try we had the third, and by far and away the most serious, leg injury. I have harped before about the openside flanker position and how prone they are to these consequences. When you think about what they're asked to do more often than anyone else, namely plant both legs firmly on the ground amid a breakdown where other bodies are falling around them at different angles, it's hardly surprising. Dan Leavy in particular has had awful luck in this area in his relatively short career at the highest level and while this came shortly after he was introduced to the action for Sean O’Brien, he had already made some key contributions. Much like Best, the entire rugby family wishes him all the best in the coming mont; he will certainly be missed by both province and country. Going back to Ulster's performance, their attacking catalyst was was John Cooney. In my preview I thought his head-to-head with Luke McGrath was going to be pivotal and while Luke did OK with some quick thinking and quality box kicks, Cooney's guile and decision making was more productive. With all due respect to Billy Burns, Cooney was more of a 9.5 than a 9. By this stage the starting Ulster centre pairing had also changed, with the returning Luke Marshall now on for Darren Cave. From an attacking lineout they managed to stretch the Leinster defence enough to create the space for Marshall to get the ball over the line. Through my blue goggles I thought maybe a pass from Marshall to Stockdale in the sequence was clearly forward, but still overall it was an impressive response after falling behind. But we weren't quite finished with the mistakes - they befell pretty much everyone at some stage on the day, even John Cooney who inexplicably pushed his conversion wide and thus denying giving his side a lead to defend going into the closing stages. In the end it was Ross Byrne's adrenaline-fuelled kicking (leg injury number 4 of 5 for those keeping score) that put Leinster in the position to bring a winning margin home, and we proceeded to do so in very impressive fashion. There was no way Ulster were going to give up and a massive shove from their pack on 73 minutes gave them possession at halfway but however much their tails were up from that turnover, the Leinster defence was well set to meet them. As a team we also beat Ulster's 2012 total with 190 made altogether, with James Ryan by far and away the match leader with a whopping 27 with none missed. And I might add that quite a few of those tackles had a massive shove two or three metres in the opposite direction thrown in for good measure. Ultimately after Ulster got through 17 phases without much progress (halfway though the series Cooney succumbed to cramp for leg injury number 5), it was that man Dave Kearney again with a massive hit and counter ruck of his own. Even at the moment of that turnover, our three point lead looked precarious with five minutes left on the clock. But by the time the full time whistle came, we had managed to make it look comfortable thanks to a remarkably controlled sequence of 40 phases that got us as far as the Ulster line, though at no stage did there seem to be any plan to go for three or five points. So that was it - victory for Leinster as most predicted but it could have easily gone the other way. Ulster came with the right attitude and did themselves proud but in the end I think our experience in this particular competition served us well in the second half. One person not directly involved on the day for whom we have to feel sorry is Joe Schmidt. He must be watching from behind the sofa as his players take to the field in such important matches; after losing Leavy and possibly Best, be must have been relieved that others had gotten through this and other matches over the weekend unscathed. But with Munster also in the semifinals and all four provinces still in Pro 14 playoff contention, there is still much anxiety left in this season for him. That shouldn't stop Leinster from chasing that fifth star, however. With a home Pro 14 semifinal in the bag we can now turn all our attention to the impending return of Toulouse to Dublin. Unfortunately due to other commitments our '80 word reviews' and 'Harpin Points' features have been suspended until further notice. Later this week we'll have the telly post on Thursday before we start looking ahead to visit of Benetton to the RDS, with of course Front Five every morning. Do stay tuned!